"How To Simplify The Process Of Building Your Own Mailing Lists On Autopilot!" Just Starting Out & Don't Have An Audience To Sell To? Wish You Could Build A Responsive List Quickly With Little Cost Involved? Wondering Exactly How The Money-Making Gurus Actually Manage to Cash-In From Their Lists? Do either of those very realistic options sound good to you? Probably not right? We can understand just how frustrating and time-consuming it can be to build your own responsive list. You might pay for advertising that works, but what about your web page? Is it converting your prospects to customers? Tried building a list yourself manually without success? Promoted opt-in pages that don't attract prospects? Paid for advertising that didn't get published when it was supposed to? Spent hours using free resources that don't even bring a response? TIP: WORK SMARTER - NOT HARDER! Why not market the smart way and use our Easy List-Builder script? You can easily have it installed on your own web server to allow you to promote to a responsive audience, without paying for it each time you post! Your Free World has developed a quality, robust script to achieve just that. It works simply but very effectively to continually build a list of prospects for you to send your offer to as frequently as you like. Complete sales letter with graphics that you can modify to suit your domain. The ability to send your email offer to your prospects whenever you wish. Ability to change the welcome email that the new subscriber receives. Mailing is disabled in demo for security purposes, so you will not be able to send any messages. Include your own sales letter to suit your site's target market. Build a list of double opt-in prospects that you can legally email. Add / remove bonus products to offer your prospects to download automatically as you see fit. Promote an instant back-door entry to your download area. (A perfect latch for promoting that is proving very popular). Add an affiliate program so others can promote your site if you wish. (Simply redirect to a one-time-offer page with an affiliate link in the payment button, such as PayDotCom). Make Your Promotions More Effective & Cost-Saving Now! Take a closer look around the internet and you'll probably find some scripts similar to this one being used... but not with as many feature and with a higher price tag. You can be in full, total control while our script automatically builds your list, adding new subscriber for you even while you sleep! It's worthwhile for you to take the first step to having your own Easy List Builder script installed on your own domain. Affordable License: You can install the script with a single use license on one domain that you own, but it's priced to be affordable for more domains. Today, You Only Pay $37 Once & The Script Is Yours Forever! And It Comes Complete With High Quality MRR Products To Offer Your New Prospects Straight Away PLUS Complete Sales Page & Product Graphics! Grab our Easy List-Builder Script Today & SAVE Money, Time, Effort, Stress & GAIN More New Prospects, Customers & Subscribers To Your List! 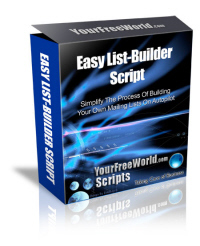 You have nothing to lose and so much more to gain by using our Easy List-Builder script.